I’ve had lunch and supper with Yrsa. I was impressed. Not just by her writing but because not only is she a prolific writer but she is also a civil engineer, a grandmother and the author of acclaimed children’s books. I didn’t ask but I expect that like Wonder Women she leaps over buildings in one bound. I’m biased because I like murder mysteries and I particularly like Icelandic murder mysteries. I’ve got a bit of a crush on her main character, the lawyer, Thora Gudmundsdottir. That’s in spite of the fact that she has a German boyfriend, Matthew, who has moved in with her. She also has a two children: ten-year-old Soley and nineteen-year-old Gylfi: Gylfi’s girlfriend Sigga; and their son, Orri, now two and a half.” Gylfi got Sigga pregnant when he was sixteen. As the story begins, Thora’s parents appear. They’re dimwits about money and have got themselves in a terrible bind. They want to move into Thora’s garage. Hmmm, as much as I like Thora, I think I’ll leave her to Matthew. One of the great strengths of Yrsa’s mysteries about Thora is that her main character is besieged by life. She worries that her parents moving in may cause Matthew to move out. She has to deal with Bella, the most obnoxious secretary in Iceland. Business isn’t always brisk and Thora and her partner scramble for work. This is the opposite of one of my favorite detectives when I was a youth: Nero Wolf. He was astute, calm, intellectual and raised orchids. While I will never lose my affection for Nero Wolf mysteries, I now much prefer Thora’s tangled life and her struggle to keep it under control while she sorts out the chaotic lives of the people who come to her for help. Although Iceland is a society in which there isn’t a lot of mayhem, there has been a financial disaster brought on by bankers thinking they could ride the wave of speculation that was going on worldwide. Iceland was the first country to crash. There were international implications and complications but those most affected were ordinary people. The currency plunged in value. People lost their homes, their jobs, their savings. Yrsa sets the novel amidst the chaos of the financial crises. She brings the society to life. Iceland, like all societies, has its psychopaths, its mentally challenged, its physically incapable, and its degenerate. It has its honest, honorable, loving, socially responsible people. The novel brings us into contact with the worst but also, in some ways, with the best. One of the best is Grimheidur, the mother of a man, Jakob, with Down’s Syndrome who has been convicted of setting a fire that killed five people. She fiercely believes in her son’s innocence. Thora begins the process of collecting information that might be used to establish that Jakob is innocent. Her investigation brings her into contact with people she normally would not meet. She has to deal with, as in real life, people whose response is governed by their own self-interest. She learns about the tragedy of a young woman who can only blink her eyes. “Hi.” He extended his hand. “I assume you’re Thora.” She nodded and he sat down at the tiny table that barely accommodated the two cups of coffee Thora had ordered, assuming the man would turn up on time. Now her cup was empty and the other one had stopped steaming.” The book is full of little scenes like this filled with what I called clincher details when I was teaching Creative Writing. These details give the narrator authenticity of voice. They allow the reader to suspend disbelief and enter the narrative. I ridiculously stayed up until 1:30 in the morning reading Someone To Watch Over Me. I slept in the next morning and staggered into the kitchen in a disheveled state to make coffee. If I have any qualms about the book it is simply that there are so many characters I found as I approached the end that I had to go back and look up just who they were. Yrsa constructs her plots well so her characters all had an important dramatic function but I did lose track of Margeir, the radio announcer, for example, in the last few chapters and had to flip back to remind myself. It’s really just a quibble when a book is 475 pages. If you like a good plot, suspense, conflict, good characterization, setting, enjoyable writing, then buy Yrsa’s latest effort. Philip Roughton does a fine job of translation. 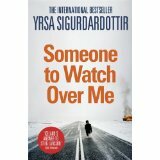 This entry was posted in Uncategorized and tagged fiction, Iceland, murder mystry, novel, Someone to Watch Over Me, Thora Gudmundsdotttir, Yrsa Sigurdardottir by william. Bookmark the permalink.